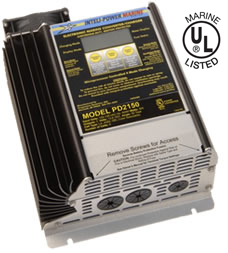 The PD2150 is a 50-amp Electronic Marine Converter/Charger capable of charging up to three separate banks of batteries at the same time. It incorporates a microprocessor that constantly monitors battery voltage, then automatically selects one of four operating modes to ensure safe, rapid recharging cycles. The Storage Mode and the Equalize Mode of operation ensures minimum battery gassing and water loss while preventing battery stratification and sulfation. All Inteli-Power chargers are designed to meet the stringent requirements of the Marine environment and are UL listed for safety. A digital meter displays current, voltage, operation mode, blown fuse indication, and battery type.